The American Irving Penn was one of the key people in building the image of Western women in the second half of the twentieth century. He joined Vogue in the late 1940s through Alexander Liberman (his job was to “come up with ideas for the covers”), and eventually established himself as a talented creator of fashion images, full of glamour and sensuality to which the post-war American society aspired. While on the one hand his near aristocratic view privileged poses of rigid formalism – which made reference to photos of previous decades – on the other hand the minimalism and the plainness perceived in his images showed, undoubtedly, the innovative nature of his work. Even when fashion itself was built on excesses, the sensitive eye of Penn filtered out the superfluous, and the resulting images were always of great elegance and sophisticated simplicity. From a simple and minimalist concept – “making clothes from a piece of cloth” – Miyake’s work is a result from the old principle of mixing a three-dimensional figure with two-dimensional material by means of folding. By combining Japanese fabric with western patterns, new technology and functionality, his “less is more” concept builds forms which are architecturally simple, elegant and of exquisite beauty. 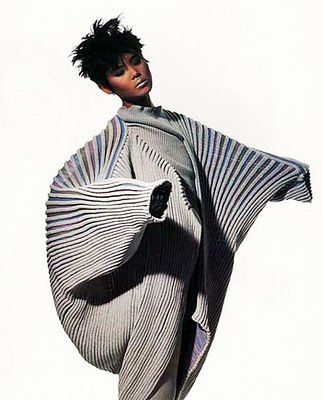 For over 20 years, between 1975 and 1998, Irving Penn portrayed Issey Miyake’s work. The merger of these two artists from such diverse cultural backgrounds was registered in 1999 in the wonderful book “Irving Penn regards the works of Issey Miyake”, by Midori Kitamura and Mark Holborn, which will be the subject of an exhibition at 21-21 Design Sight in Tokyo, Japan, starting in September. This union, which at first seemed unusual, has produced hundreds of stunning images, in that their work turned out to be a mirror to each other’s work. Under Penn’s influence, the models’ poses turned Miyake’s clothes into true sculptures, portraying scenes that look more like fragments of dance moves; Miyake, in turn, gave Penn a chance to exercise his formal rigor with textures, shapes and masks from another culture. And the union of these two “masters of reduction,” as defined by Holborn in the foreword of the book, yielded images of a dry, sharp and accurate nature, which offer no room for anything beyond the essentials. The result of this beautiful partnership, which Miyake poetically called “silent understanding”, proves that the concepts of beauty and elegance can indeed be universal – and can gently touch the most unique souls throughout eternity.